Provide comfort for the family of Paula DuPree with a meaningful gesture of sympathy. Paula was one of the sweetest people I ever knew and she had a huge heart. Although we had lost touch, I will miss her. My thoughts and prayers are with her family. I am so sorry for your loss. wishing the best for you and your family. 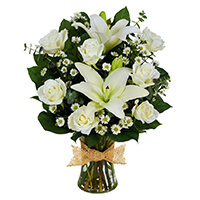 Bob Schroeder purchased the Tribute Mixed Vase Arrangement - All White for the family of Paula DuPree.